[Jim] has been working with a team from various Universities to develop an intuitive way to guide and train assistance robots. They focused on one particular technique, training a robot to follow on a leash in the same way you would a pet dog (PDF). 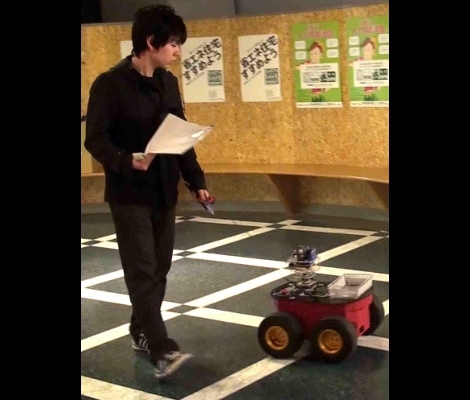 He was inspired to send in a link to his research after reading about the Kinect-powered shopping card robot. He figures that that project is similar to his own, but his does have several added benefits. The first being that if a robot is on a leash, everyone knows who that bot is following or assisting. But there is the added benefit of the user needing no training whatsoever. That’s because the act of walking a dog on a leash is commonplace in developed societies; you may not have ever owned a dog, but you’ve seen others walking them on leashes numerous times and could do so yourself without any training. The leash connects to a sensor-filled turret in the center of the robot’s body. The bot can sense when, and in which direction the user is pulling the leash. There’s also an emergency kill switch on the handle for added functionality. Take a look at some of the test video after the break to see how quickly humans can adapt to this type of user interface. Unless you’re research concerns low-level motion control or requires a cutting edge platform, there is no reason to spend your precious research dollars on the newest gadgets. I’d rather see older but adequate robots being used and have the savings go to pay for more graduate students to use them. Bravo on the interesting project. you could make it recognise hand signals etc..
Is anyone else thinking that training a pet is much more work than programming behavior directly in a programming language?? I tried to train my cat but the fraken fraker bit the frak out of me when I tried to plug in the usb cable! Now they need to make the robot randomly stop, weave in front of you or pull you across the street to go sniff another robot’s rcharge point. @ColinB – training allows semi-emergent behaviour. Programming requires a coder. I wish I had the source code to my family’s dog.